PSG to accept Arsenal offer for Edinson Cavani Arsenal are keen to sign Paris Saint-Germain striker Edinson Cavani, according to several reports including Metro. 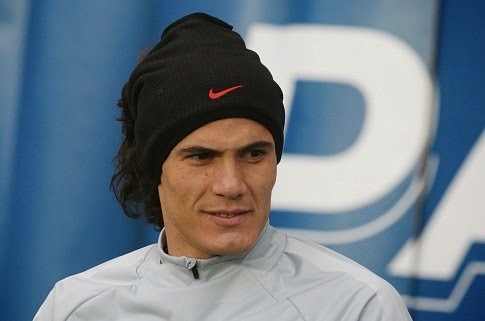 Arsenal are keen to sign Paris Saint-Germain striker Edinson Cavani, according to several reports including Metro. Edinson Cavani has been strongly linked with a move away from France with Manchester United and Arsenal keeping tabs on the player. Arsenal current striking options include Danny Welbeck and Olivier Giroud who both are yet to impress in front of goals. Meanwhile, Lukas Podolski, Joel Campbell and Yaya Sanogo are out on loan and are likely to seal a permanent move in the summer. Cavani has already expressed his desire to play in the Premier League with reports further revealing that he is not happy at PSG. The Uruguayan has not been given his favourite central role due to the presence pf Zlatan Ibrahimovic. Despite of playing in the left attacking side he has managed 40 goals in 71 appearances. Metro reported that the Gunners are preparing a club record fee around £50million for the former Napoli man. And reports further revealed that the French giants are ready to sell their forward for £50million. Manchester United boss Louis van Gaal is also keen to sign Cavani as they plans to offload Radamel Falcao back to AS Monaco.